If you’ve ever played a game at a gaming table, you probably already know just how much fun it can be. This goes for almost any game you can play, including air hockey, foozball, pool, and more. You probably also know, if you’ve ever looked into buying one of these tables, how costly they can be. The good news is that you don’t have to spend a fortune to get a great gaming table for your home. There are actually several ways to create a DIY gaming table. Read on to learn more about how to create a DIY gaming table of your choice and about the many benefits of adding one of these tables to your home. 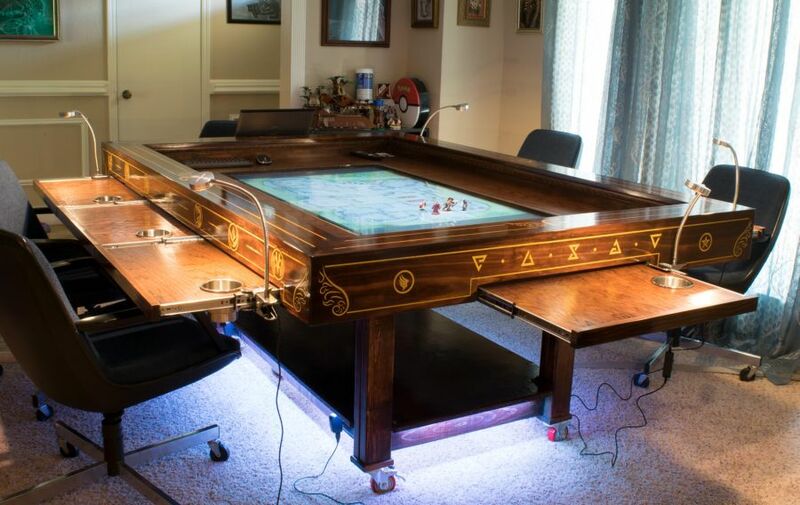 First things first, you should know that, if you have a large table that you can tweak, then you basically have a DIY gaming table at your disposal. A big table can easily be sanded down, stripped, and changed in any way you see fit if you are crafty enough. 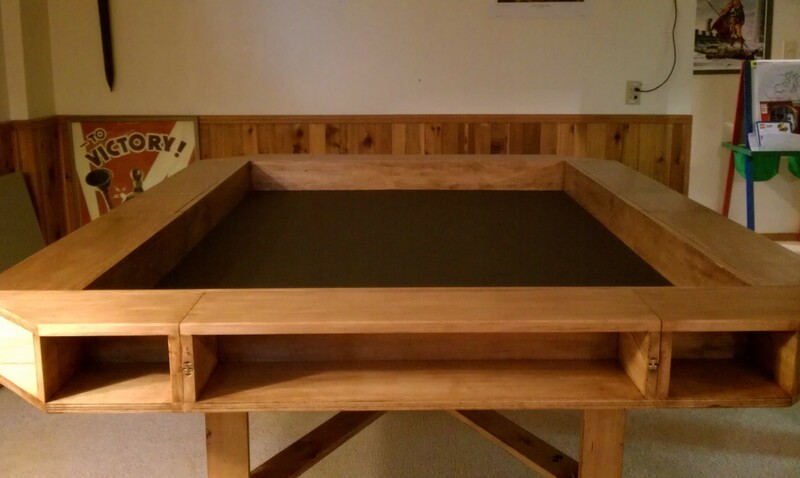 It is especially easy to turn a large table into a table for tabletop or RPG games. If you don’t yet have a large table that you can use in your transformation, keep your eyes peeled! You can typically find nice, roomy tables for cheap prices at thrift stores, yard sales, and more. So, look around and try to find a bargain. As you choose or even make a base table for your gaming table, remember to keep height in mind. 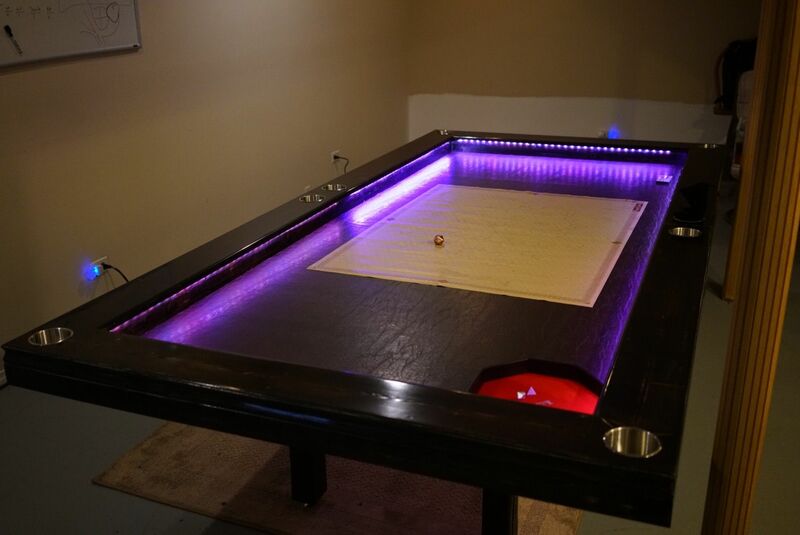 Obviously, if you’re going to make a gaming table for simple board games, which you play seated, your table will need to be a different height than if you’re building your own pool table or air hockey table, tables at which you’ll play standing up. Thus, consider the height of you and other people who are likely to play at your game table. Giving a little thought to height now can help you greatly when it comes to enjoying your table in the future. And, if you’re really feeling brave and up to a “crafting challenge,” remember that you could always make your table with expanding and foldable legs. That way, you could easily create a multi-game table that can be adjusted to your needed height depending on what game you’re playing and/or who is playing with you. Something else that can really help you as you create your own gaming table is to download templates and rules off the internet. Obviously, if you’re making a general gaming table, like for board games or RPG games, you don’t have to worry so much about this. But, with games like pool and air hockey, there are different size and dimension requirements you’ll need to keep in mind. And, no matter how well you may think you know the game, chances are you’ll forget something if you’re not following the rules and regulations carefully. If you’re trying to build a DIY gaming table that is suitable for RPG type games or tabletop games, consider adding an internal gaming vault. This will allow you to set the game set deeply and carefully into the table so that you don’t actually have to touch or potentially mess up your gaming board or landscape. You can do this by drilling or cutting a suitable size opening into the table, putting your board or landscape in, and then covering it with glass. If you want to be able to play different games on your table, make it so that the glass can easily be removed and the boards rearranged as desired. You may even want to consider lighting this internal area, which should typically be about four to six inches down inside the table. While lighting the table does take a bit more time and effort, it’s worth it since you can play in the dark and even use your illuminated gaming table as a cool showpiece. In addition to ensuring your gaming table is suitable for playing the game or games of your choice, you may also want to think about adding on some little “extras” that can make your game play a lot more fun. For example, why not drill some cupholders into the side so that you and your pals can enjoy a cold beverage while you play? There are even some fancy game tables people have made with refrigerated compartments for storing drinks and snacks. You might also want to add dice or card holders, ash trays, pull-out drawers for storing rules and guidebooks, and anything else you think you might like. The sky is truly the limit when you make your own gaming table, so use your imagination and try to create something that has everything you could ever want when gaming and then some. As a final piece of advice, remember that you’re most likely to enjoy your game table and to keep it around for years to come if you make it a multi game table. After all, if you build your gaming table around one particular game, what are you going to do with it when you get tired of that game or when, at the very least, your friends don’t want to play it anymore? As much as you may love a certain game right now, try to think of the future to come and create a gaming table that can be used with and for lots of different games. Creating reversible, easy to flip tabletops that can be changed as desired is a great way to create a gaming table that can be used over and over again and for all kinds of games. IS BUILDING A GAMING TABLE REALLY WORTH IT? As you can see, there is a lot to think about and a lot of work to do if you want to build your own DIY gaming table, especially if you do plan to add in lots of little extras. When thinking about all of this hard work, you may find yourself wondering whether or not it’s really worth it. We would have to say a big yes. Having your own gaming table comes with a lot of great benefits that should more than make up for your efforts. While there are certainly some upfront costs involved in building your own gaming table, such as the cost of your tools and materials, chances are that you will end up saving quite a bit of money in the long run. This is especially true if you are someone who typically goes to gaming stores in order to play. These stores often charge a fee to pay or require you to buy something for the time you spend in the store. These costs can quickly add up, especially if you are a regular gamer. When you have your own gaming table, however, you don’t have to spend a cent after you build it, and neither do your friends. In fact, if you really wanted to, you could charge your friends a small fee for the convenience of using your gaming table, actually making you money in the process. Even if you don’t do that, you should save yourself a nice chunk of money in the long run by having and enjoying your own gaming table. In addition to saving money, having your own gaming table can make your home the most fun and most happening place to be. 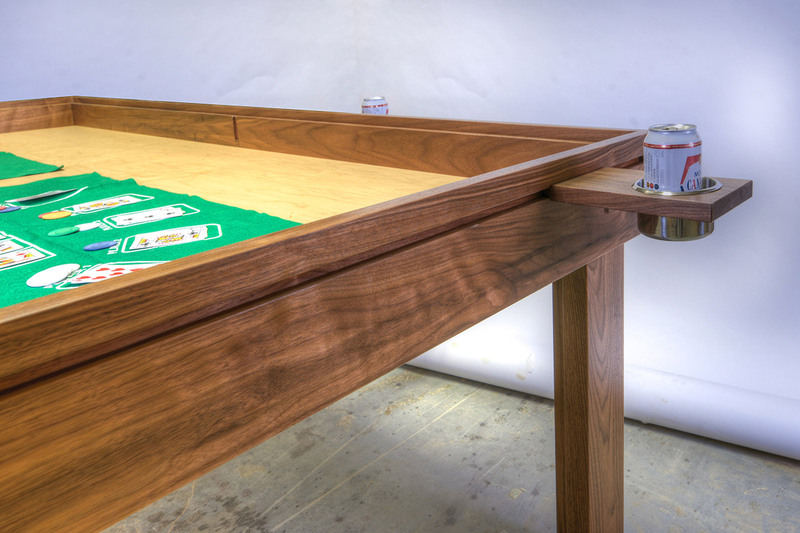 Your friends will all want to come over and use your gaming table. This should make you very popular and should make your home a nice place to be for gaming get togethers. If you like hosting parties and having friends over, then having your own gaming table is truly great. Plus, you and your friends will never have to worry about having or finding somewhere to play to your heart’s desire. You don’t even have to worry about closing hours when the local gaming hotspot is right in your very own living room. One final benefit of having a gaming table is that you have an easy way to reduce stress and relieve anxiety right in your own home. After a rough day, you can come home and game with friends or family, and, really, what could be better than that? If you’re ready to start experiencing these benefits and more, then you’re ready to get started on creating your own gaming table.